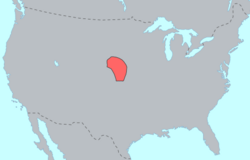 The Pawnee (also Paneassa, Pari, Pariki) are a Native American tribe that historically lived along the Platte, Loup and Republican Rivers in present-day Nebraska. They refer to themselves as "Chaticks-si-Chaticks," meaning "Men of men." They practiced a mixed agricultural and hunting lifestyle, with an elaborate mythology tied closely to their understanding of astronomy. For a time they practiced a ritual involving the human sacrifice of an adolescent girl to the morning star. 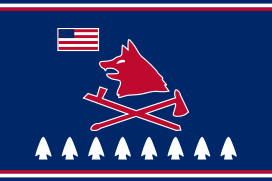 The Pawnee cooperated with the United States army, serving as scouts and supporting them against other tribes in the plains. However, they were pressured into ceding their lands in Nebraska to the U.S. government and relocated to a reservation in Oklahoma. In the nineteenth century, epidemics of smallpox and cholera wiped out most of the Pawnee, reducing the population to approximately 600 by the year 1900; by the early twenty-first century there were approximately 2,500 Pawnee. Contemporary Pawnee have revived their traditional culture and celebrate powwows and other gatherings in their homelands of Nebraska as well as in Oklahoma. Such revivals, together with compensation for underpayment for their lands and government assistance programs have renewed their pride and are allowing the Pawnee to find their rightful place in the emerging world that values all cultures. Descended from Caddoan linguistic stock, the Pawnee were an agricultural people who grew maize, beans, pumpkins and squash. With the coming of the horse culture to the Great Plains they began to take on some of the cultural attributes of their cousins, but the buffalo culture always remained secondary to the maize culture. The Chaui are generally recognized as being the leading band although each band was autonomous and, as was typical of many Indian tribes, each band took care of its own affairs. Outside pressures from the Spanish, French and Americans, as well as neighboring tribes, did see the Pawnee drawing closer together. 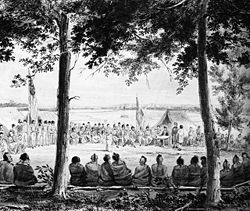 Pawnees in a parley with Major Stephen Long's expedition at Council Bluffs, Iowa, in 1819. Francisco Vásquez de Coronado visited the neighboring Wichita in 1541 where he encountered a Pawnee chief from Harahey, north of Kansas or Nebraska. Nothing much is mentioned of the Pawnee until the seventeenth and eighteenth centuries when successive incursions of Spanish, French and English settlers attempted to enlarge their possessions. The tribes however tended to make alliances as and when it suited them. Different Pawnee bands could make treaties with warring European powers without disrupting the underlying unity; the Pawnee were masters at unity within diversity. The Villasur expedition is attacked by the Pawnee. 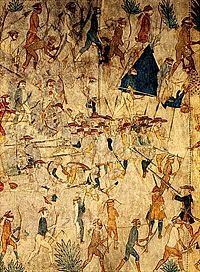 In the eighteenth century, the Pawnee were allied with the French and played an important role in halting Spanish expansion onto the Great Plains by defeating the Villasur expedition decisively in battle in 1720. Historian Marcel Trudel has documented close to 2,000 Pawnee slaves who lived in Canada until the abolition of slavery at the end of the eighteenth century, making up close to half of the known slaves in French Canada. A tribal delegation visited President Jefferson and in 1806 Lieutenant Zebulon Pike, Major G. C. Sibley, Major S. H. Long, amongst others began visiting the Pawnee villages. 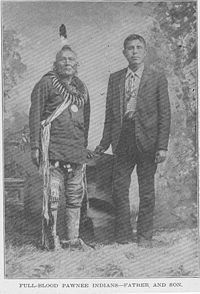 The Pawnee ceded territory to the American government in treaties in 1818, 1825, 1833, 1848, 1857, and 1892; in 1857, they settled on a reservation along the Loup River in present-day Nance County, Nebraska. Continual raids from Lakota from the north and west and encroachment from American settlers to the south and east lead to the abandonment of their Nebraska reservation. In 1875 they moved to Indian Territory, (Oklahoma), a large territory that had served as a 'dumping ground' for tribes displaced from the east and elsewhere. Many Pawnee men joined the United States Cavalry as scouts rather than face the ignominy of reservation life and the inevitable loss of their freedom and culture. In the twentieth century, Christianity supplanted the older religion. In 1780 the Pawnee are thought to have numbered around 10,000, but by the nineteenth century, epidemics of smallpox and cholera wiped out most of the Pawnee, reducing the population to approximately 600 by the year 1900. There has been recovery, however, and in 2005, there were approximately 2,500 Pawnee. Pawnee earth lodges tended to be oval in shape; the frame was constructed of 10 to 15 posts set some ten feet apart which outlined the floor of the lodge. Lodge size varied based on the number of poles placed in the center of the structure. Most lodges had four, eight, or twelve center poles. A common feature were the four painted poles which represented the four semi-cardinal directions and the four major star gods (not to be confused with the Creator.) The framework was then covered with willow branches, earth, and sod which inhibited erosion. A hole was left in the center which served as a combined chimney and skylight. The lodge itself was semi-subterranean and the floor was approximately three feet below ground level. A buffalo-skin door on a hinge could be closed at night and wedged shut. There could be as many as 30-50 people living in each lodge. A village could consist of as many as 300-500 people and 10-15 households. Each lodge was divided in two (north and south), and each section had a head who oversaw the daily business; each section was further subdivided into three families. The membership of the lodge was actually quite flexible. The tribe went on buffalo hunts in summer and winter. Upon their return, the inhabitants of the lodges would often move into another lodge, although they generally remained within the village. 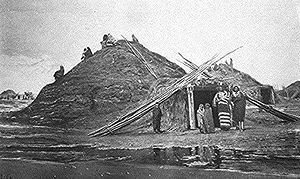 The Pawnee were a matrilineal people; ancestral descent was through the mother and a young couple would traditionally move into the bride's parents' lodge. Both women and men were active in political life, with both taking decision-making responsibilities. Within the lodge the above mentioned sections were designated for the three classes of women. Women tended to be responsible for decisions about resource allocation, trade, and inter-lodge social negotiations. Men were responsible for decisions which pertained to hunting, war, and spiritual/health issues. Women tended to remain within a single lodge, while men would typically move between lodges taking multiple sexual partners in serial-monogamous relationships. The Pawnee placed great significance on Sacred Bundles, which formed the basis of many religious ceremonies maintaining the balance of nature and the relationship with the gods and spirits. The Pawnee were not however part of the Sun Dance cult although they did partake in the Ghost Dance movement of the 1890s. Pawnee equated the stars with the gods and planted their crops according to the position of the stars. Like many tribal units they sacrificed maize and other crops. Tirawa (also Atius Tirawa) was the creator god and was believed to have taught the Pawnee people tattooing, fire-building, hunting, agriculture, speech, and clothing, as well as religious rituals (including the use of tobacco) and sacrifices. He was associated with most natural phenomena, including stars and planets, wind, lightning, rain, and thunder. The solar and lunar deities were known as Shakuru and Pah, respectively. that an observatory lodge’s smoke hole would be constructed to view certain parts of the heavens-such as the Pleiades. Through both the historical and archaeological record, it is clear that the Pawnee lifestyle was centered, at its very core, on the observation of the celestial bodies. The positions and construction of their lodges placed their daily life in the center of a scaled down universe, and allowed them to observe the greater universe outside and reminded the Pawnee of their role of watching and, more importantly, perpetuating the universe. According to one Skidi Pawnee man at the beginning of the twentieth century, “The Skidi were organized by the stars; these powers above made them into families and villages, and taught them how to live and how to perform their ceremonies. The shrines of the four leading villages were given by the four leading stars and represent those stars which guide and rule the people”. The Pawnee paid very close attention to the movement of the universe, but they also felt that for the universe to continue functioning, the Pawnee people had to perform regular ceremonies. These ceremonies were performed before events such as semi-annual hunts as well as before many other important times of the year. The most important ceremony of the Pawnee culture, the Spring Awakening ceremony, also known as the Morning Star ritual, was meant to awaken the earth and ready it for planting. The Skidi practiced human sacrifice (the "Morning Star ritual") until the 1840s. Typically, a young girl was captured from another tribe, based on a dream by a Skidi elder. The girl was well treated for several days, and an elaborate scaffold was built for the sacrifice. The preparations took four days. The position of the stars was an important guide to the time when this ceremony should be held. The earth lodge served as an astronomical observatory and as the priests sat inside at the west, they could observe the stars in certain positions through the smokehole and through the long east-oriented entranceway. They also kept careful watch of the horizon right after sunset and just before dawn to note the order and position of the stars. The sacrifice was performed only in years when Mars was morning star and usually originated in a dream in which the Morning Star appeared to some man and directed him to capture a suitable victim. The dreamer went to the keeper of the Morning Star bundle and received from him the warrior’s costume kept in it. He then set out, accompanied by volunteers, and made a night attack upon an enemy village. As soon as a girl of suitable age was captured the attack ceased and the party returned. The girl was dedicated to the Morningstar at the moment of her capture and was given into the care of the leader of the party who, on its return, turned her over to the chief of the Morning Star. Returning to the village, the girl was treated respectfully but was also isolated from the rest of the camp. She was ritually cleansed and a five day ceremony was begun around her. The Morning star priest would sing songs and the girl was symbolically transformed from human form to be among the celestial bodies. Here the girl became the ritual representation of the Evening Star; she was not impersonating the god but instead had become an earthly embodiment. On the final day of the ceremony, the girl was moved outside to where a scaffold had been erected and outfitted to represent “Evening Star’s garden in the west, the source of all animal and plant life.” The priests then removed her clothing. The procession was timed so that she would be left alone on the scaffold at the moment the Morning star rose. When the morning star appeared, two men came from the east with flaming brands and touched her lightly in the arm pits and groins. Four other men then touched her with war clubs. The man who had captured her then ran forward with the bow from the Skull bundle and a sacred arrow and shot her through the heart while another man struck her on the head with the war club from the Morning Star bundle. The officiating priest then opened her breast with a flint knife and smeared his face with the blood while her captor caught the falling blood on dried meat. All the male members of the tribe then pressed forward and shot arrows into the body. They then circled the scaffold four times and dispersed. To fulfill the creation of life, the men of the village would take on the role of the Morning star, which is why two men would come from the east with flaming brands, representing the sun. The men then acted out the violence which had allowed the Morning Star to mate with the Evening star in their creation story, with a “meteor stone”. During the Morning Star ceremony, the captive was shot in the heart and a “man struck her on the head with the war club from the Morning Star bundle”. By having all the men in the village shoot arrows into her body, the village men, embodiments of Morning Star, were symbolically mating with her. Her blood would drip down from the scaffolding and onto the ground which had been made to represent the Evening Star’s garden of all plant and animal life. Her blood was then fertilizing the ground, while the spirit of the Evening Star was released and with that sacrifice they were ensuring the success of the crops and in turn the perpetuation of the Universe. Not all Pawnee approved of this ritual murder of an innocent child. In 1816, a Pawnee chief named Petalesharo rescued the young girl from the scaffold as the priests were about to perform the sacrifice. He accused them of cruelty and, with the support of other Pawnee warriors, was able to bring to an end this custom. The Oklahoma Indian Welfare Act of 1936 established the Pawnee Business Council, the Nasharo (Chiefs) Council, and a tribal constitution, bylaws, and charter. An out-of-court settlement in 1964 awarded the Pawnee Nation $7,316,096.55 for undervalued ceded land from the previous century. Bills such as the Indian Self-Determination and Education Assistance Act of 1975 have gone some way to address the mistakes of the past and help the Pawnee Nation regain some of their pride and culture. Today the Pawnee continue to celebrate their culture and meet twice a year for the inter-tribal gathering with their kinsmen the Wichita and the four day Pawnee Homecoming for Pawnee veterans in July. Many Pawnee return to their traditional lands to visit relatives, craft shows, and take part in powwows. ↑ 2011 Oklahoma Indian Nations Pocket Pictorial Directory. Oklahoma Indian Affairs Commission. 2011: 27. Retrieved January 25, 2012. ↑ 3.0 3.1 Patricia J. O'brien, "Prehistoric evidence of Pawnee Cosmology." American Anthropologist. New Series, 88(4) (Dec. 1986): 939-946. ↑ Alice C. Fletcher, "Star Cult among the Pawnee-A Preliminary Report." American Anthropologist, New Series, 4(4) (Oct. 1902): 730-736. ↑ 5.0 5.1 5.2 Ralph Linton, "The origin of the Pawnee Morning Star Sacrifice." American Anthropologist, New Series, 28(3) (July 1926): 457-466. ↑ Carl Waldman, Encyclopedia of Native American Tribes (New York, NY: Checkmark Books, 2006, ISBN 9780816062744). All links retrieved January 31, 2019. Accessgeneology, Pawnee Indian Tribe from the book, Handbook of American Indians, 1906. This page was last modified on 31 January 2019, at 17:27.